Dolce & Gabbana The One Collector's Edition is a symbol of luxury. 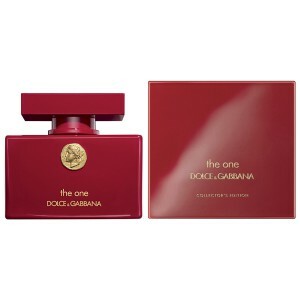 Dolce & Gabbana The One Collector's Edition 75ml. Eau De Parfum offers captivating tones of fruit and luscious flowers. This fragrance is a symbol of luxury, elegance and femininity. Visitors will be attracted mainly by its perfect interplay of ingredients and unprecedented sophistication. The women's fragrance Dolce & Gabbana The One Collector's Edition will be all day to feel very feminine, attractive and elegant. Sultry beginning of this luxury fragrance will soon deliver sweet notes of peach and juicy mandarin. Exotic Lychee perfectly blend with bergamot. The floral heart is hidden heady aroma of lilies. This is complemented by delicate notes of vanilla and amber exciting, whose flavor is even more pronounced enchanting musk. Female fragrances Dolce & Gabbana The One Collector's Edition was launched in 2014. Luxury fragrance Dolce & Gabbana The One Collector's Edition is perfect for women who love luxury, originality and uniqueness. Feel free to Wrap yourself in a captivating tone of this fragrance that around you instantly create an attractive aura of elegance and sensuality. Significantly red bottle fragrance perfectly captures the thrilling and bold flavors that are hidden inside. The One the Collector's Edition is - female edition, which is dressed in ruby red bottle decorated with a coin minted profile antique diva symbolizes absolute luxury and elegance. This mysterious eastern floral fragrance chooses its heroine energetic woman with a strong character that fascinates surrounding power of the mind and wise decisions. Amazing song at the beginning of open bright, juicy accords of bergamot, mandarin, ripe peach and exotic lychee. But the heart of the fragrance sounds much more concise, it is filled with the gentle play of colors of the majestic white lilies. Curious, tempt base is represented by hot amber, soft, languid and sensual vanilla musk.